Here's an event to put on your calendars! "For one week, September 23-29, we challenge you to spend a little time each day sewing for yourself. And of course, we would love for you to share what you make!! Use hashtag #selfishsewing on instagram and twitter, and add your photos to the [flickr group] here." Yes, "selfish sewing week" - an event sponsored by Made with Moxie and imagine gnats. What a novel idea, where much of what we make is for charity, gifts, or anyone but ourselves. Do you think we can meet the challenge? Let's try! Earlier this week my friend Leanne/shecanquilt was trying various methods for making flying geese blocks, and I suggested she pull all her research into a post. She kindly did and it's worth a read! 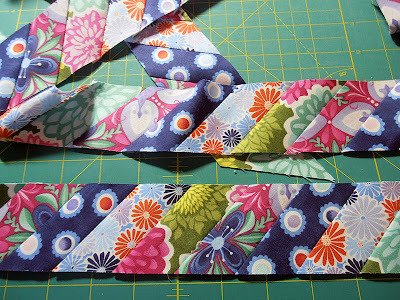 And then Toni/HoosierToni recently posted a tutorial on the ever-popular Churn Dash block. I adore the double one she made and need to try that one of these days! Curious - do you keep an eye on your blog stats? I kind of like to see "what's popular" at any given time, and it's interesting that my binding tutorials have been getting alot of (re-)visits lately. Go figure. But as a reminder, the striped binding instructions are here . . .
and that infamous matched binding is here. Well, I better close up shop for the morning and get ready for the weekend. Along with many of my guild-mates, I'm heading to the Pacific Northwest Modern Quilt Guild Meetup in Portland, OR. With 9 'local' guilds attending, I certainly hope to meet up with some of you! wonderful randomness, Debbie. Hope you enjoy the meet-up. I love flying geese but haven't been good at making accurate ones. I'm looking forward to reading Leanne's post. Have fun at the meet-up. I was invited to come by Holly of the Vancouver MQG but we had just come home from that area and I didn't foresee another trip for me this summer. That meetup sounds like so much fun! I really need to read Leanne's post since I enjoy flying geese so much. 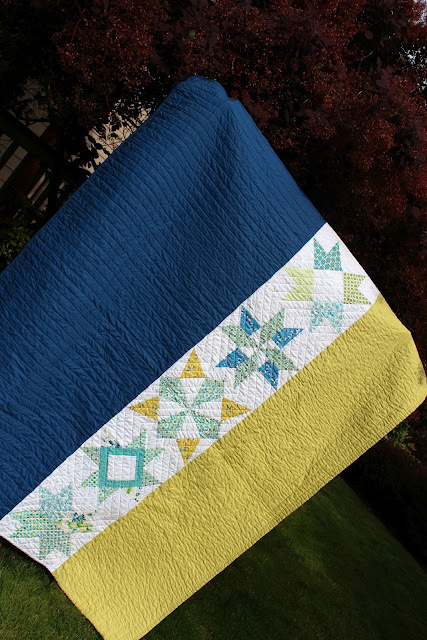 And you've reminded me how much I liked your Solstice Stars quilt. So pretty! Thanks for the mention, too! I liked Leanne's post too. Very informative and helpful. I'm always interested in tools, but hate to spend money on ones that won't actually be helpful. It's good to know those rulers work. Also--have fun this weekend. I wish I lived closer to a modern quilt guild. Have fun at the meet-up! And love seeing Solstice Stars again- one of my favourites! Thanks for all those great links! Have fun at your meet up! Great stuff this week! I rarely look at my blog stats, but I'm definitely pinning your binding tutorials! And that double churn dash is super cool. I will also check out the flying geese research. Have a fabulous weekend.